The mechanisms underlying better immune protection by mucosal vaccination have remained poorly understood. In our current study we have investigated the mechanisms by which respiratory virus-mediated mucosal vaccination provides remarkably better immune protection against pulmonary tuberculosis than parenteral vaccination. A recombinant adenovirus-based tuberculosis (TB) vaccine expressing Mycobacterium tuberculosis Ag85A (AdAg85A) was administered either intranasally (i.n.) or i.m. to mice, and Ag-specific CD4 and CD8 T cell responses, including frequency, IFN-γ production, and CTL, were examined in the spleen, lung interstitium, and airway lumen. Although i.m. immunization with AdAg85A led to activation of T cells, particularly CD8 T cells, in the spleen and, to a lesser extent, in the lung interstitium, it failed to elicit any T cell response in the airway lumen. In contrast, although i.n. immunization failed to effectively activate T cells in the spleen, it uniquely elicited higher numbers of Ag-specific CD4 and CD8 T cells in the airway lumen that were capable of IFN-γ production and cytolytic activities, as assessed by an intratracheal in vivo CTL assay. These airway luminal T cells of i.n. immunized mice or splenic T cells of i.m. immunized mice, upon transfer locally to the lungs of naive SCID mice, conferred immune protection against M. tuberculosis challenge. Our study has demonstrated that the airway luminal T cell population plays an important role in immune protection against pulmonary TB, thus providing mechanistic insights into the superior immune protection conferred by respiratory mucosal TB vaccination. Vaccination is always the most effective treatment against any infectious disease. Tuberculosis (TB)3 is no exception. Currently >80% of the world’s population has been vaccinated with Calmette-Guérin bacillus (BCG). Despite this, TB remains the second leading infectious cause of death worldwide (1). Thus, there is a need to develop more effective TB vaccines. Over the last decade, although efforts have focused on the use of recombinant vaccine methodologies to design new vaccine candidates, the majority of these vaccines are only suitable for the parenteral route of vaccination and have been shown to be less efficacious than BCG in experimental models. Confronting such limited success, an increasing effort has been made to investigate the potential of mucosal vaccination, and emerging evidence suggests that respiratory mucosal vaccination provides better immune protection against pulmonary TB than parenteral vaccination (2, 3, 4, 5). However, the immune mechanisms underlying such enhanced protection by respiratory mucosal vaccination remain to be understood. In other models, mucosal vaccination or infection has previously been shown to be effective at producing long-lasting T cell responses at the site of immunization. For instance, Gallichan and Rosenthal (6) have shown that long term maintenance of CTL activity in mucosal tissue is dependent upon mucosal vaccination, whereas mucosal CTL activity by parenteral vaccination wanes, suggesting that mucosal vaccination preferentially induces a long-lasting, tissue-specific CTL. Furthermore, Woodland et al. (7) have described a CD8 T cell population that resides in the lung after respiratory viral infection. This T cell population was maintained by proliferation and was described to be functional, but not directly cytolytic (8, 9, 10). We and others (3, 11, 12, 13) have shown that BCG administered via the respiratory route was more effective than when it was given s.c. Recently, we have demonstrated that a single respiratory mucosal, but not i.m., administration of a recombinant adenoviral vector expressing Ag85A conferred potent protection against mucosal Mycobacterium tuberculosis (M.tb) challenge, and such protection was mediated by both CD4 and CD8 T cells (4). We have also demonstrated that mucosal administration of such a vaccine most potently boosted immune protection by plasmid DNA vaccination (4). In a recent study, modified vaccina Ankara Ag85A vaccine was shown to be a more effective booster for BCG when administered intranasally (i.n.) than when delivered i.m. (5). Because B cells seem dispensable for immune protection against TB (14), it is believed that T cells play an important role in anti-TB mucosal immunity. However, it remains largely unclear whether parenteral and mucosal vaccinations lead to differential T cell responses in various tissue compartments and whether such differential T cell responses underpin the superior protection by mucosal vaccination. Using an adenovirus-based TB vaccine and a murine model of mucosal and parenteral vaccination that we have recently developed (4), our current study was designed specifically to address 1) whether respiratory mucosal and i.m. vaccinations lead to differential activation of CD4 and CD8 T subsets; 2) whether these two different routes of vaccination lead to differential distribution of CD4 and CD8 T cells in systemic lymphoid tissue, lung, and respiratory tract lumen; and 3) how such differential T cell responses elicited by respiratory mucosal vaccination lead to better protection against airway M.tb challenge. Six- to 10-wk-old female BALB/c mice were purchased from Harlan Laboratory. All mice were housed in a specific pathogen-free, level B facility. All experiments were conducted in accordance with the guidelines of the animal research ethics board of McMaster University. The development of a recombinant, replication-deficient adenoviral TB vaccine expressing M.tb Ag85A (AdAg85A) has been previously described (4). Mice were immunized with a dose of 5 × 107 PFU of AdAg85 via either an i.n. or i.m. route (4). Briefly, anesthetized mice either were injected once in each quadriceps with 25 μl of PBS for a total of 50 μl containing 5 × 107 PFU of AdAg85A or were allowed to slowly breathe in 25 μl of PBS containing 5 × 107 PFU of AdAg85A (4). Mycobacterium bovis BCG (Connaught strain) and M.tb (H37RV strain) (ATCC 27294; American Type Culture Collection) were grown in Middlebrook7H9 broth supplemented with Middlebrook OADC enrichment (Invitrogen Life Technologies), 0.002% glycerol, and 0.05% Tween 80 for ∼10–15 days, then aliquoted and stored at −70°C until needed. Before each use, BCG or M.tb bacilli were washed with PBS containing 0.05% Tween 80 twice and passed through a 27-gauge needle 10 times to disperse clumps. For the challenge study with BCG, 5 × 106 CFU of live BCG bacilli were administered via the intratracheal route in 40 μl of PBS, as previously described (15). BCG-infected mice were killed 5 days after challenge, and cells were isolated and stimulated as described below. For M.tb challenge, i.m. and i.n. immunized and nonimmunized mice were infected i.n. with 10,000 CFU of M.tb at the indicated time points after immunization at the level III containment facility of McMaster University. The level of bacterial burden was determined at the described time points in the lung and spleen by plating serial dilutions of tissue homogenates in triplicate onto Middlebrook 7H10 agar plates containing Middlebrook OADC enrichment (3, 4). Plates were incubated at 37°C for 21 days in semisealed plastic bags. Colonies were then counted, calculated, and presented as log10 CFU per organ. BALB/c mice immunized via the i.n. or i.m. route were killed either 2 or 8 wk later. Spleens and lungs were removed aseptically and isolated individually to examine each individual mouse’s response. Cells from the spleens were isolated as described previously, and 0.5 × 106 cells were seated into a 96-well plate in 250 μl of RPMI 1640 supplemented with 5% FBS and 100 μg/ml penicillin and streptomycin and stimulated with Ag85 complex protein (8 μg/ml). The culture supernatants were collected at 72 h and stored at −20°C for IFN-γ measurement (16). In some experiments the respiratory tract of lungs was lavaged to separate the intra-airway luminal cells from the lung interstitial cells. Briefly, the mouse lung was lavaged five times to a volume of 1.8 ml of PBS through a polyethylene cannulated into the trachea to ensure maximal recovery, as previously described (17). Lavage cells were then centrifuged and enumerated. Total lung tissue-derived cells were isolated from lungs that had undergone lavage and those that had not, depending on the experimental requirements. Briefly, lungs were perfused through the left ventricle with Hanks’ buffer. The lungs were then cut into small piece (>1 × 1 mm) and incubated with collagenase type 1 (150 U/ml) for 1 h at 37°C. Lung fragments were then crushed through a 100-μm pore size filter (4). Cells were collected and enumerated. Single cell suspensions from i.n. or i.m. immunized mice were obtained from the spleen or lung as described above and were cultured in a 96-well plate at a concentration of 20 × 106 cell/ml; bronchoalveolar lavage-derived cells were cultured at a concentration of 5 × 106 cell/ml. Cells were cultured in the presence of Golgi plug (10 μg/ml brefeldin A; BD Pharmingen) with or without stimulation by Ag85A-specific CD4 (LTSELPGWLQANRHVKPTGS) or CD8 (MPVGGQSSF) T cell peptides at a concentration of 1 μg/well for 5 h. Cells were then washed and blocked with CD16/CD32 in 0.5% BSA/PBS for 15 min on ice, then stained with the appropriate Abs against cell surface markers. Cells were washed, permeabilized, and stained according to the manufacturer’s instructions included in the intracellular cytokine staining (ICCS) kit (BD Pharmingen). The Abs used were CD8a-PE-Cy7, CD4-allophycocyanin-Cy7, IFN-γ-allophycocyanin, and CD44-CyChrome CD62L-PE (BD Pharmingen). Stained cells were then run on an LSR II, and 250,000 events were collected per sample (BD Pharmingen) and analyzed on WinMDI2.8 software (The Scripps Research Institute). The i.v. in vivo CD8 and CD4 CTL assays were conducted as previously described (18, 19). CTL target cells were derived from spleen cells, then pulsed with either Ag85A CD8-specific peptide or, in separate experiments, Ag85A CD4-specific peptide or with no peptide overnight at 4°C. Peptide-pulsed cells were labeled with a high concentration of CFSE (5 μM) or unpulsed cells with a low concentration of CFSE (0.5 μM). Cells were then washed and enumerated. For i.v. in vivo CTL, 5 × 106 pulsed and 5 × 106 unpulsed cells were combined to a final 200 μl of PBS and i.v. injected into vaccinated mice. Mice were killed 5 and 24 h after in vivo target cell incubation for CD8 and CD4 CTL assays, respectively (the specificity of in vivo CD4 CTL was verified using CD8 T cell depletion or β2-microglobulin−/− mice). The intratracheal in vivo CTL assay was developed based on the i.v. CTL protocol with modifications. Briefly, 2.5 × 106 pulsed cells and 2.5 × 106 unpulsed cells were combined to a final 40 μl of PBS and transferred intratracheally to vaccinated mice. Mice were killed at 5 h for CD8 CTL and at 24 h for CD4 CTL. Total cells isolated from the spleen or respiratory tract by bronchoalveolar lavage (intratracheal CTL) were run on the FACScan (BD Pharmingen) for assessment of the percentage of CFSE-labeled target cells. The percent in vivo killing of CFSE-labeled target cells was defined as the relative loss of such cells after in vivo incubation and thus was taken as the measure of CTL. It was calculated using the formula: % killing = [1 − (unpulsed cells/peptide-pulsed cells from unimmunized control)/(unpulsed/peptide pulsed from immunized group)] × 100. 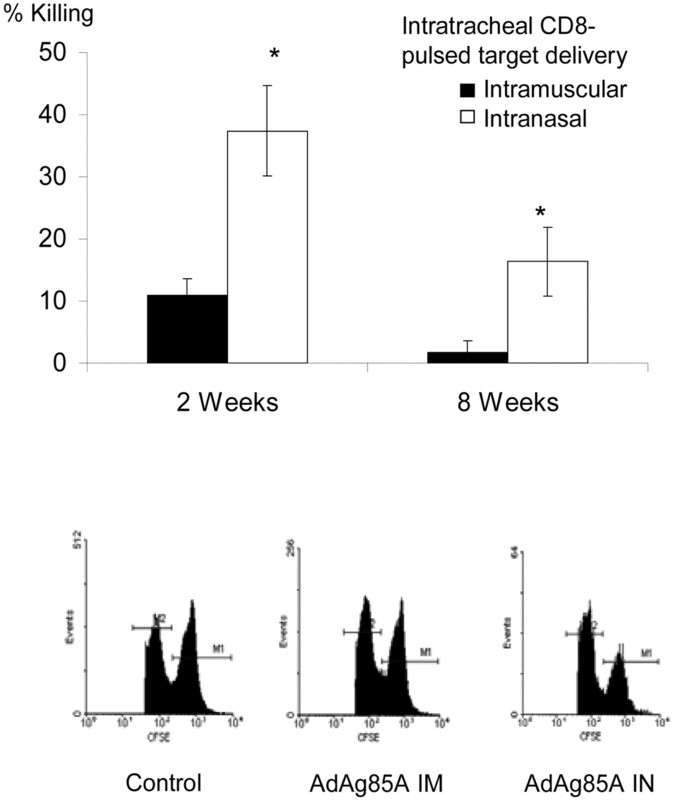 BALB/c mice were immunized intranasally; 4 wk later, they were killed, and extensive bronchoalveolar lavage was conducted to recover intrarespiratory tract luminal cells. Luminal cells were then plated for 2 h at a concentration of 5 × 106 cells/ml. Total lymphocytes were separated from other leukocytes by adherence, and 7 × 105 lymphocytes were intratracheally transferred to the lungs of naive SCID mice. One day after cell transfer, these mice were challenged intranasally with 10,000 CFU of M.tb as described above. SCID mice were killed 4 wk later, and spleens and lungs were removed and processed for bacterial colony enumeration. In a separate experiment, BALB/c mice were immunized i.m. ; 4 wk later, they were killed, and spleens were removed. The spleens were processed as described above to obtain a single cell suspension. Positive T cell selection was conducted by FACSort on a FACSDIVA (BD Pharmingen) with CD3-CyChrome and CD4− CD8-PE mAbs (BD Pharmingen). Purified splenic T cells (2 × 106/mouse) were intratracheally transferred to the lungs of SCID mice. One day after cell transfer, these mice were challenged i.n. with 10,000 CFU of M.tb as described above. SCID mice were killed 4 wk later, and spleens and lungs were removed and processed for bacterial colony enumeration. The level of IFN-γ in the culture supernatants was determined using a mouse-specific IFN-γ ELISA kit (R&D Systems). The sensitivity of detection of the kit was 2 pg/ml. Comparison of differences was performed using unpaired Student’s t test. The difference was considered statistically significant at p ≤ 0.05. BALB/c mice were either i.m. or i.n. immunized with AdAg85A and challenged i.n. with 10,000 CFU of M.tb at 8 wk after vaccination. Mice were killed, and lungs and spleens were examined for mycobacterial burden. Although i.n. administration of AdAg85A provided marked protection against pulmonary M.tb challenge in both lung (Fig. 1⇓) and spleen (data not shown), i.m. AdAg85A immunization provided little protection compared with the nonimmunized control (Fig. 1⇓). These results are in agreement with our previous observations (4) and illustrate a great difference in the level of immune protection in the lung, determined by the route of vaccination. Protection by respiratory mucosal, but not parenteral, vaccination with AdAg85A. BALB/c mice were immunized with either AdAg85A i.m. (IM) or AdAg85A i.n. (IN; 5 × 107 PFU/mouse); 8 wk later, mice were challenged i.n. with 10,000 CFU of M.tb. Mice were killed 8 wk later, and lungs were examined for colony enumeration. Data represent the mean ± SEM of eight mice per group. ∗∗∗, p < 0.005 (compared with naive control or i.m. immunization). To begin investigating the mechanisms underlying the sharp difference in immune protection by parenteral and respiratory mucosal vaccinations, we first examined the immune response in a systemic/peripheral lymphoid organ induced by AdAg85A immunization. To this end, mice were immunized either i.m. or i.n. with AdAg85A and were killed 2 and 8 wk after immunization. The ability of Ag85 complex protein-stimulated splenic lymphocytes to produce IFN-γ was examined by ELISA, whereas the frequency of Ag-specific IFN-γ+ CD4 and CD8 T cells was determined by ICCS after stimulation with CD4 or CD8 peptides. Intramuscular AdAg85A immunization led to far higher levels of IFN-γ production in cell culture supernatants from splenocytes stimulated by Ag85 complex protein at both 2 and 12 wk after immunization (Fig. 2⇓A). The frequency of IFN-γ+ CD8 T cells was also much higher in the spleen after i.m. immunization than after i.n. immunization at both 2 and 8 wk postimmunization (Fig. 2⇓B). Although to a lesser extent, the frequency of IFN-γ+ CD4 T cells was also higher in the spleens of i.m. immunized mice than in the spleens of i.n. immunized mice (Fig. 2⇓C). Overall, i.m. immunization induced many more Ag-specific CD8 T cells than CD4 T cells in the spleen. These results indicate that i.m. immunization with AdAg85A potently activates T cells, particularly CD8 T cells, in the spleen, whereas i.n. immunization induces relatively little T cell response in the systemic lymphoid organ, suggesting that the immune response observed in the spleen may have minimal bearing on the ultimate protection observed in the lung. T cell responses in spleen. BALB/c mice were immunized with AdAg85A either i.m. or intranasally (5 × 107 PFU/mouse) and were killed 2 or 12 wk (A) or 2 and 8 wk (B and C) later. Splenocytes were isolated and cultured with Ag85A complex protein for 72 h (A). The level of IFN-γ release was assayed by ELISA. 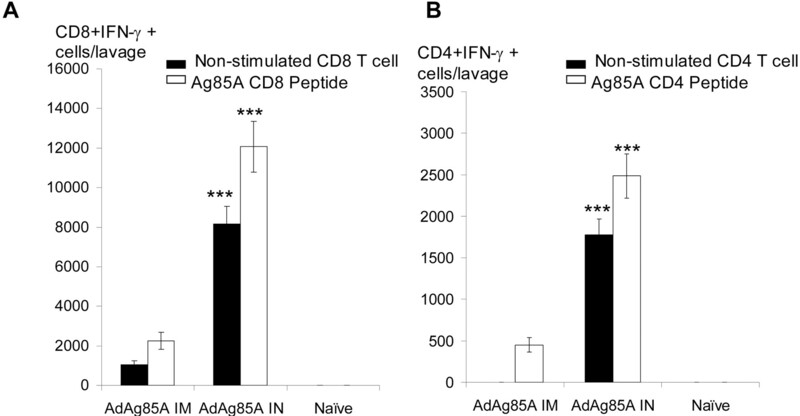 The frequency of IFN-γ+ CD8 and CD4 T cells was assayed using splenocytes cultured in the presence of Ag85A-specific CD8 T cell (B) or CD4 T cell (C) peptide for 5 h in culture. Cells were stained for ICCS and run on a flow cytometer as described in Materials and Methods. Data represent the mean ± SEM in triplicate samples (A) or the mean ± SEM of three mice per group, representative of two independent experiments (B and C). ∗, p < 0.05; ∗∗, p < 0.01; ∗∗∗, p < 0.005 (compared with i.n. immunization). Because the lung is where primary immune protection takes place, and recent evidence suggests that a substantial portion of memory T cells reside in the peripheral tissue outside the lymphoid organ (20, 21, 22), we next examined Ag-specific CD4 and CD8 T cell responses in the lung after i.m. and i.n. AdAg85A vaccinations. To accomplish this, we isolated cells by collagenase dispersion and used ICCS after CD4 and CD8 peptide stimulation to examine the frequency of Ag-specific IFN-γ+ T cells. In contrast to what we observed in the spleen, a significantly greater number of Ag85A peptide-specific IFN-γ+ CD8 T cells was observed in the lungs of i.m. 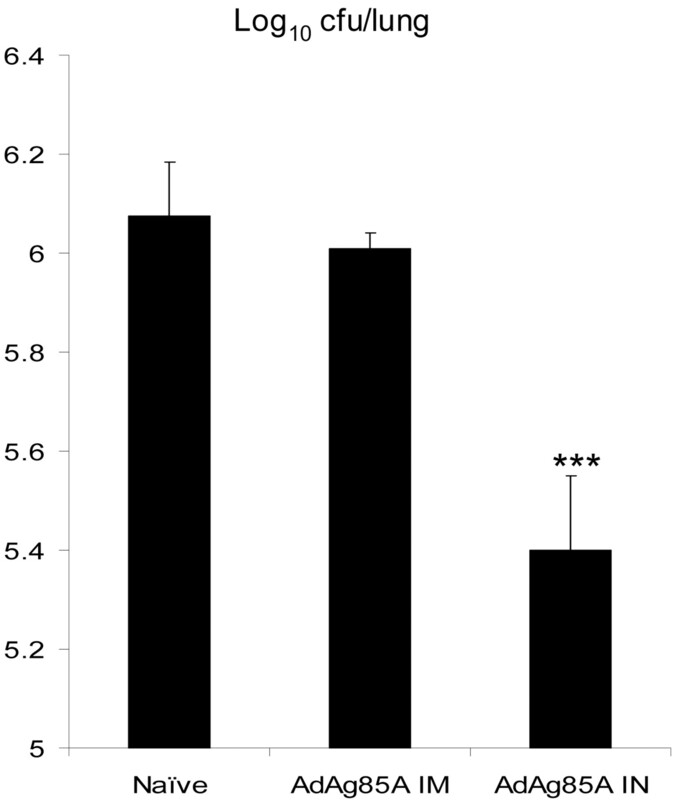 immunized mice at 2 wk, but not at 8 wk, after immunization (Fig. 3⇓A). A greater number of peptide-specific IFN-γ+ CD4 T cells were induced by i.n. immunization at 2 wk, although no significant difference was seen by 8 wk (Fig. 3⇓B). Thus, these results indicate that as the site of our analysis moved from a peripheral lymphoid organ (spleen) to the lung, the potency of parenteral vaccination became less obvious (higher CD8 T cell responses seen only at wk 2), and the advantage of mucosal vaccination began to emerge (higher levels of CD4 T cell activation). T cell responses in whole lung tissue. BALB/c mice were immunized with AdAg85A either i.m. or i.n. (5 × 107 PFU/mouse) and were killed 2 or 8 wk after immunization. Total lung mononuclear cells were isolated by collagenase disruption as described in Materials and Methods and were cultured with either Ag85A-specific CD8 peptide (A) or CD4 peptide (B) for 5 h. Cells were stained for ICCS and run on a flow cytometer as described in Materials and Methods. Data represent the mean ± SEM of three mice per group, representative of two independent experiments. ∗, p < 0.05 (compared with i.n. immunization; A); ∗∗, p < 0.01 (compared with i.m. immunization; B). Having observed that parenteral immunization induced higher levels of T cell activation in the spleen, as measured by Ag-driven IFN-γ responses, we examined a different T cell functional readout, CTL activity, using an i.v. in vivo CTL assay. Thus, after i.v. delivery of CFSE-labeled CD8 CTL target cells to i.m. or i.n. vaccinated mice, the extent of target cell lysis could be monitored by FACS in the spleen. Consistent with greater numbers of IFN-γ+ CD8 and CD4 T cells in the spleens of i.m. vaccinated mice, i.m. vaccination led to much higher levels of CD8 and CD4 CTL in the spleen at both wk 2 and 6 (Fig. 4⇓). Intravenous in vivo CD8 and CD4 CTL assays. BALB/c mice were immunized with AdAg85A either i.m. or i.n. and were killed 2 and 6 wk after immunization. Ag85A-specific CD8 T cell peptide-pulsed target cells were transferred i.v., and the spleen was examined 5 h later for the measurement of CD8 T cell-mediated CTL (A). In separate experiments, Ag85A-specific CD4 T cell peptide-pulsed target cells were transferred i.v., and 24 h later, the spleen was examined for CD4 T cell-mediated CTL (B). Data represent the mean ± SEM of six mice per group. ∗, p < 0.05; ∗∗, p < 0.01; ∗∗∗, p < 0.005 (compared with i.n. immunization). We have observed that although i.n. immunization induced higher levels of CD4 T cell responses in the whole lung tissue only at wk 2, i.m. immunization still induced higher levels of CD8 T cell responses in the whole lung at wk 2. These data, obtained in a setting where the whole lung was treated as a single entity, could not entirely explain the superior protection against M.tb challenge in i.n. immunized mice, nor could they explain the lack of protection in i.m. immunized mice. To further investigate, the lung was examined as two separate compartments: the respiratory tract (airway) lumen and the lung interstitium. To this end, cells within the airway lumen were obtained by extensive bronchoalveolar lavage, whereas cells from interstitial tissue were obtained by collagenase disruption of the lung that had been lavaged. The cells were then incubated with or without Ag85A T cell peptides and analyzed by ICCS. Although upon peptide stimulation (without stimulation, few IFN-γ+ cells could be detected; not shown), a significant number of Ag-specific, IFN-γ+ CD8 and CD4 T cells could be readily detected in the airway lumen of i.n. immunized mice at both 2 and 8 wk, such T cells were hardly detectable in the airway lumen of i.m. immunized mice (Fig. 5⇓, A and B). Greater than 95% of these IFN-γ-producing CD4 and CD8 T cells were found to be of the memory phenotype, expressing CD44high and CD62Llow (data not shown). Similarly, when we examined the luminal CD4 and CD8 T cells positive for TNF-α, we observed 1) that all TNF-α+ T cells were also positive for IFN-γ, but not all IFN-γ+ T cells were positive for TNF-α; 2) that there were more double-positive CD4 and CD8 T cells in the airway lumen after i.n. AdAg85A vaccination than after i.m. vaccination (wk 2, 3,400 ± 727 and 38,500 ± 9,820/lavage of i.n. group vs 0 ± 0 and 3,680 ± 813/lavage of i.m. group for CD4 and CD8 T cells, respectively; wk 8, 190 ± 14 and 4,690 ± 431/lavage of i.n. group vs 0 ± 0 and 142 ± 14/lavage of i.m. group for CD4 and CD8 T cells, respectively). To address whether such luminal T cell populations induced by i.n. immunization were persistent, we immunized mice either i.m. or i.n. with AdAg85A and analyzed the luminal T cells at 6 mo after immunization. Indeed, i.n. immunization induced a long-lasting CD8 T cell population within the airway lumen, whereas, not surprisingly, there were hardly any Ag-specific CD8 T cells detected in the airway lumen of i.m. immunized mice (Fig. 5⇓C). In comparison with the luminal T cells, the profile of Ag-specific CD4 and CD8 T cells in the lung interstitial compartment of i.n. and i.m. immunized mice remained similar to that seen in the whole lung (Fig. 5⇓, D and E, and Fig. 3⇑). In general, we observed greater numbers of CD8 T cells in the lung interstitium 2 wk after AdAg85A i.m. vaccination and more CD4 T cells in the lung interstitium 2 wk after AdAg85A i.n. vaccination. However, by 8 wk, the differences were no longer observed (Fig. 3⇑ and Fig. 5⇓, D and E). 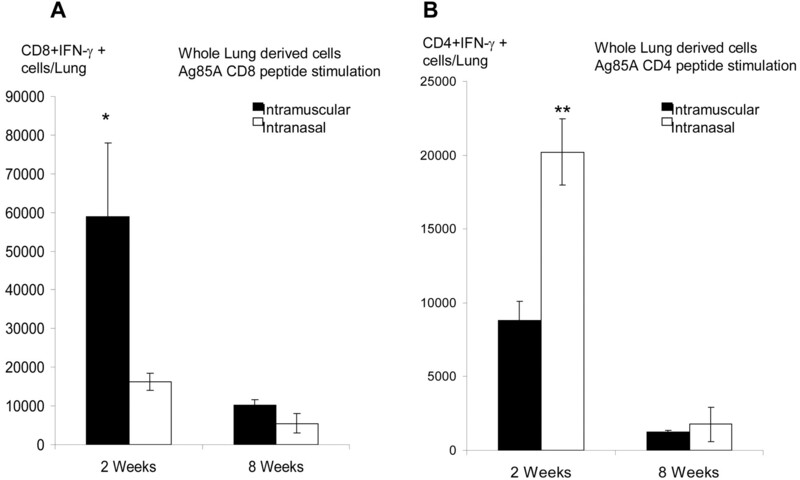 Together, these data indicate that although parenteral immunization could result in relatively transient accumulation of Ag-specific CD8 T cells in the lung interstitium, it failed to effectively elicit CD4 T cell responses in the lung and was completely unable to activate and retain CD4 and CD8 T cells in the airway lumen. T cell responses in the airway lumen and the lung interstitium. BALB/c mice were immunized with AdAg85A either i.m. or i.n. (5 × 107 PFU/mouse) and were killed 2 or 8 wk (A, B, D, and E) or 6 mo (C) after immunization. Airway lumen-derived cells were obtained from exhaustive bronchoalveolar lavage (A–C). Lung interstitial mononuclear cells were isolated from lavaged lungs by collagenase disruption. Both airway lumen and lung interstitial cells were cultured with either Ag85A-specific CD8 T cell peptide (A, C, and D) or CD4 T cell peptide (B and E) for 5 h. Cells were immunostained for ICCS and run on a flow cytometer as described in Materials and Methods. Data represent the mean ± SEM of three mice per group, representative of two independent experiments (A, B, D, and E) or are expressed as histograms of pooled cells from three mice per group (C). ∗, p < 0.05; ∗∗, p < 0.01 (compared with i.m. immunization). To further examine the function of airway luminal T cells, we conducted an intratracheal in vivo CTL assay. In this case, CD8 T cell peptide-pulsed CFSE-labeled target cells were transferred to immunized mice via the intratracheal route, as opposed to i.v. route. Indeed, significantly increased CD8 CTL activity was observed in the airway lumen of i.n. immunized mice at both 2 and 8 wk, whereas relatively little CD8 CTL was detected in the airway lumen of i.m. immunized mice (Fig. 6⇓). Of interest, little CD4 CTL activity was observed at the airway lumen in either i.n. or i.m. immunized mice (data not shown). Intratracheal in vivo CD8 CTL assay. BALB/c mice were immunized with AdAg85A either i.m. or intranasally and were killed 2 and 8 wk after immunization. Ag85A-specific CD8 T cell peptide-pulsed target cells were transferred intratracheally into the lung of vaccinated mice. The lungs were lavaged 5 h after cell transfer. Data represent the mean ± SEM of four mice per group, representative of two independent experiments. ∗, p < 0.05. The bottom histograms are representative of the data from one mouse for each condition 2 wk after immunization. To examine the ability of airway luminal T cells to respond to respiratory mycobacterial infection, mice were immunized with AdAg85A i.n. or i.m. and challenged intratracheally with M. bovis BCG 8 wk after immunization. The airway luminal CD4 and CD8 T cells were collected by lavage 5 days after mycobacterial challenge, incubated with or without T cell peptide stimulation, and examined by ICCS. Overall, consistent with the presence of few T cells in the airway lumen of i.m. immunized mice (Fig. 5⇑, A and B), the secondary responses of luminal CD4 and CD8 T cells were also very small (Fig. 7⇓). In contrast, consistent with the presence of a great number of luminal CD4 and CD8 T cells in i.n. immunized mice (Fig. 5⇑, A and B), a robust secondary response of CD4 and CD8 T cells was observed in the airway lumen of these mice upon intratracheal mycobacterial challenge (Fig. 7⇓). This conclusion is supported in particular by the fact that there was a markedly increased number of Ag-specific IFN-γ+ CD4 and CD8 T cells in the airway lumen even without exogenous peptide stimulation (Fig. 7⇓), contrasting with the lack of such responses in the airway lumen of similarly i.n. immunized mice before mycobacterial challenge (Fig. 5⇑, A–C). Such enhanced secondary T cell responses in mucosally immunized mice were most likely due to the intraluminal mycobacterial exposure and the continuing presence of mycobacterial Ags in cell culture. Along with the increased numbers of airway luminal T cells, there was increased IFN-γ production by splenocytes of i.n. mice upon in vitro Ag restimulation (data not shown). The above results indicate the mechanism underlying potent immune protection from M.tb challenge conferred by respiratory mucosal, but not parenteral, vaccination. Secondary T cell responses in the airway lumen after pulmonary mycobacterial challenge. BALB/c mice were immunized with AdAg85A either i.m. (IM) or i.n. (IN) or received no treatment (naive) and were challenged with 5 × 106 CFU of BCG intratracheally 8 wk after immunization. Airway lumen-derived cells were obtained by bronchoalveolar lavage 5 days after challenge and were cultured with or without either Ag85A-specific CD8 T cell peptide (A) or CD4 T cell peptide (B) for 5 h. Cells were stained for ICCS and run on a flow cytometer as described in Materials and Methods. Data represent the mean ± SEM of four mice per group, representative of two independent experiments. ∗∗∗, p < 0.005 (compared with i.m. immunization or unstimulated controls). To directly demonstrate the immune protective potential of airway luminal T cells in mucosally vaccinated hosts, total lymphocytes were isolated by lavage from the respiratory tract of i.n. AdAg85A-vaccinated BALB/c mice and transferred intratracheally to the lungs of naive SCID mice. These SCID mice were then challenged with M.tb and were killed 4 wk after challenge. Compared with the controls, a marked reduction (close to 1 log) in the number of viable M.tb bacilli was observed in both lungs and spleens of the SCID mice receiving adoptively transferred lymphocytes (Fig. 8⇓). These results suggest that the intraluminal T cells induced by mucosal vaccination are fully capable of protection against M.tb challenge in vivo even in the absence of systemic supply of T cells. In contrast, parenteral (i.m.) immunization elicited few T cells in the airway lumen and thus failed to provide protection from M.tb challenge regardless of the systemic activation of CD8 T cells. These findings highlight the importance of T cells located on the surface of the respiratory tract, the point of M.tb entry. Immune protection of SCID mice from M.tb challenge by intra-airway luminal T cells of i.n. immunized mice or by splenic T cells of i.m. immunized mice. BALB/c mice were immunized i.n. (IN) or i.m. (IM) and were killed 4 wk later. Naive SCID mice were transferred intratracheally with 7 × 105 lymphocytes isolated from bronchoalveolar lavage fluids of IN mice or 2 × 106 T cells purified from the spleen of IM mice. One day after cell transfer, SCID mice were challenged i.n. with 10,000 CFU of M.tb. SCID mice were killed 4 wk later; lung (A) and spleen (B) were examined for colony enumeration. Data represent the mean ± SEM of four to six mice per group. ∗, p < 0.05; ∗∗, p < 0.01; ∗∗∗, p < 0.005 (compared with controls). We postulate that the T cells systemically activated by i.m. vaccination have immune protective potential and that the failure of these T cells to be mobilized into the airway upon M.tb challenge underlies the lack of protection. To investigate this, we also purified CD4 and CD8 T cells (>95% purity by FACSort) from the spleens of AdAg85A i.m. vaccinated mice and transferred these T cells intratracheally into the lungs of SCID mice. These SCID mice were challenged with M.tb and were killed 4 wk after challenge. Compared with the controls, a marked reduction (close to 1 log) in the number of viable M.tb bacilli was observed in both lungs and spleens of the SCID mice receiving adoptively transferred T cells (Fig. 8⇑). The importance of these results is 2-fold: first, they show that the location of T cells is of the utmost importance to protection against M.tb challenge, and secondly, they show that the T cells from AdAg85A i.m. vaccinated mice are also protective. These results highlight the fact that it is necessary for sufficient memory T cells to be located in the airway at the time of challenge. Mucosal immunization represents an understudied area in the field of TB vaccination; it has received increasing attention because the respiratory tract is the natural route of M.tb infection, and it is believed that mucosal vaccination provides the best protection from mucosal infectious diseases (23).We have recently shown that mucosal immunization with a novel recombinant adenoviral-based vaccine expressing an M.tb immunodominant protein, Ag85A, provides superior protection over that produced by parenteral immunization (4). However, the underlying mechanisms have remained to be elucidated. In this study we have examined whether parenteral and mucosal vaccinations lead to differential T cell responses in various tissue compartments and how such differential T cell responses may contribute to the superior protection by mucosal vaccination. In general, we found that although mucosal immunization with AdAg85A led to superior immune responses only at the mucosal surface of the lung, parenteral vaccination led to far superior systemic immune responses. Specifically, respiratory mucosal immunization uniquely elicited higher numbers of Ag-specific CD4 and CD8 T cells in the airways, capable of IFN-γ production, cytotoxic lysis of target cells, and immune protection against M.tb infection. In comparison, parenteral i.m. immunization led to activation of T cells, particularly CD8 T cells, in the peripheral lymphoid organs, but failed to elicit airway luminal T cells and protect the lung from M.tb infection. Not only was respiratory mucosal vaccination able to elicit geographically different T cell responses (retaining T cells within the airway lumen), but it induced differential T cell responses, potently activating both CD4 and CD8 T cell responses in the lung. In comparison, parenteral i.m. vaccination induced predominantly a CD8 T cell response in the peripheral lymphoid organs and, to a lesser degree, in the lung interstitial compartment. The potency of i.n. AdAg85A vaccination is unlikely to be due to a greater level of Ag85A expression, because we have previously shown that i.n. delivery of adenoviral vector does not lead to a higher level of transgene protein production in the lung than the level of transgene protein in the bloodstream accomplished by i.m. delivery of the same dose of adenoviral vector (24). Because only i.n. immunized mice were protected from airway M.tb challenge, and adoptive transfer of airway luminal T cells from these mice protected SCID mice from M.tb challenge, it is strongly indicated that such an intra-airway luminal T cell population plays an important immune protective role and that the lack of this T cell population accounts for the lack of protection in parenterally immunized mice. Additional support of this point comes from our observation that splenic T cells from i.m. immunized mice could also protect SCID mice from pulmonary M.tb challenge when these T cells were forced to localize to the airway lumen by means of adoptive intratracheal transfer. Furthermore, our findings suggest that systemic T cell activation may not be absolutely required for local lung immune protection and emphasize the importance of examining T cell responses locally in the lung after TB vaccination of any route. It is noteworthy that we have previously shown a small, but significant, level of immune protection 4 wk after i.m. vaccination (4), which is probably accounted for by a transient accumulation of Ag85A-specific CD8 T cells in the lung interstitial space, as observed in our current study. The critical role of CD4 T cells in anti-TB immunity has been extensively documented (25, 26, 27, 28). In contrast, mounting evidence suggests that CD8 T cells may also play a role in anti-TB immunity (26, 29, 30). Our laboratory has recently shown that a low dose BCG vaccination was able to provide potent protection from airway M.tb challenge in the absence of CD4 T cells (31). Furthermore, CD8 CTL epitopes have been described against M.tb in mouse strains on a variety of genetic backgrounds (32). In our current study, intra-airway luminal CD8 T cells were found to persist up to 6 mo after i.n. 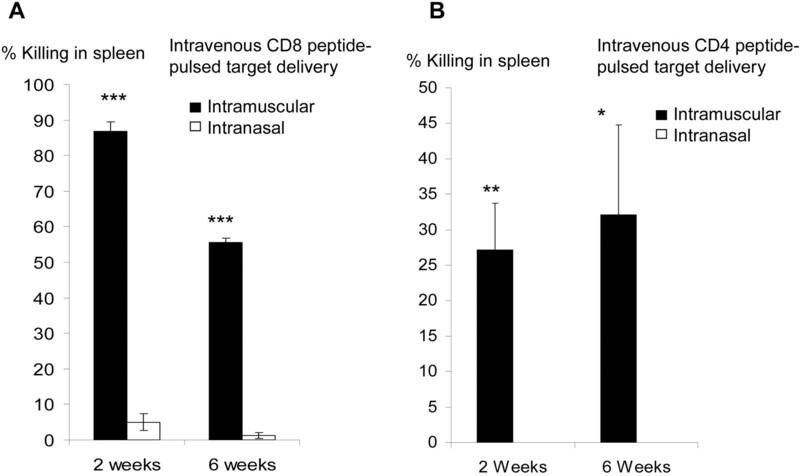 immunization and retain the ability to kill Ag-specific peptide-pulsed target cells, as demonstrated by our intratracheal in vivo CD8 CTL assay. Our finding is also supported by a previous report that mucosal vaccination elicited a longer-lived CTL activity by mucosal CD8 T cells, as assessed by an in vitro CTL assay (6). The immune protective role by both CD4 and CD8 T cells in our current model is also supported by our previous finding that systemic depletion of either CD4 or CD8 T cells dampened immune protection against M.tb by i.n. AdAg85A immunization (4). At present, the mechanism by which T cells are retained and maintained within the airway lumen even long after i.n. immunization remains to be elucidated. However, there is evidence that airway luminal T cells have the ability to self-renew after respiratory viral infection (8, 10). Furthermore, it is believe that after mucosal vaccination, Ag-specific memory T cells preferentially home back to the site of vaccination and other mucosal sites (33). Recently, certain integrin molecules have been implicated in mucosal T cell homing (34), and in this regard, α4 integrin has been associated with higher levels of IFN-γ+ T cells in the lung after mycobacterial challenge (35, 36). Whether this is the case in our model remains to be investigated. The question of why Ag-specific CD8 T cells present in the spleen and the lung interstitial compartment in parenterally AdAg85A-immunized mice fail to confer protection is of particular interest. It is possible that airway luminal T cells play a dual role, being able not only to provide direct immune protection but also to facilitate the recruitment of effector immune cells into the airway lumen and/or activate the T cells residing with the interstitial compartment. Thus, because i.m. immunized mice lacked airway luminal cells, the T cells residing outside the airway lumen cannot be recruited into the airway or be properly activated. Secondly, the relative lack of potency in CD4 T cell activation by parenteral immunization may also be attributable to the lack of protection. Our current findings provide a clue to understanding why the current plasmid DNA i.m. immunization is unable to trigger potent protection against pulmonary TB (37, 38, 39, 40). It is noteworthy that parenteral immunization with genetic vaccines may differ from BCG-based parenteral immunization, in that the latter provides protection, perhaps due to the dissemination of live bacilli to the lung, where they facilitate desired T cell responses. We are currently investigating this contention. Currently there are few mucosal TB vaccines. BCG was originally administered orally, but is now being administered topically to the skin due to side effects (41). Although we and others (3, 11, 12, 13) have shown in experimental models that BCG may be given i.n. for better protection, it is very unlikely that this will be amenable to human immunization. Our current study suggests that recombinant viral-based TB vaccines represent promising mucosal vaccine platforms and lends support to the advantage of mucosal vaccination in the fight against mucosal infectious disease. We are grateful to Anna Zganiacz, Chuyan Ying, Jaina Leitch, Duncan Chong, and Xueya Feng for their invaluable technical assistance, and to Dr. Jonathan Bramson for providing CFSE. ↵1 This work was supported by funds from the Canadian Institutes of Health Research. M.tb CFP and Ag85 complex protein were provided by Colorado State University through funds from the National Institute of Allergy and Infectious Diseases (Contract 1-AI-75320). ↵3 Abbreviations used in this paper: TB, tuberculosis; BCG, Calmette-Guérin bacillus; ICCS, intracellular cytokine staining; i.n., intranasally; M.tb, Mycobacterium tuberculosis. World Health Organization. 2001. WHO vaccine preventable diseases: global summary World Health Organization, Geneva. .
McShane, H., A. A. Pathan, C. R. Sander, S. M. Keating, S. C. Gilbert, K. Huygen, H. A. Fletcher, A. V. Hill. 2004. Recombinant modified vaccinia virus Ankara expressing antigen 85A boosts BCG-primed and naturally acquired antimycobacterial immunity in humans. Nat. Med. 10: 1240-1244. Chen, L., J. Wang, A. Zganiacz, Z. Xing. 2004. Single intranasal mucosal Mycobacterium bovis BCG vaccination confers improved protection compared to subcutaneous vaccination against pulmonary tuberculosis. Infect. Immun. 72: 238-246. Wang, J., L. Thorson, R. W. Stokes, M. Santosuosso, K. Huygen, A. Zganiacz, M. Hitt, Z. Xing. 2004. Single mucosal, but not parenteral, immunization with recombinant adenoviral-based vaccine provides potent protection from pulmonary tuberculosis. J. Immunol. 173: 6357-6365. Goonetilleke, N. P., H. McShane, C. M. Hannan, R. J. Anderson, R. H. Brookes, A. V. Hill. 2003. Enhanced immunogenicity and protective efficacy against Mycobacterium tuberculosis of bacille Calmette-Guérin vaccine using mucosal administration and boosting with a recombinant modified vaccinia virus Ankara. J. Immunol. 171: 1602-1609. Gallichan, W. S., K. L. Rosenthal. 1996. Long-lived cytotoxic T lymphocyte memory in mucosal tissues after mucosal but not systemic immunization. J. Exp. Med. 184: 1879-1890. Ely, K. H., A. D. Roberts, D. L. Woodland. 2003. Cutting edge: effector memory CD8+ T cells in the lung airways retain the potential to mediate recall responses. J. Immunol. 171: 3338-3342. Woodland, D. L.. 2003. Cell-mediated immunity to respiratory virus infections. Curr. Opin. Immunol. 15: 430-435. Barclay, W. R., W. M. Busey, D. W. Dalgard, R. C. Good, B. W. Janicki, J. E. Kasik, E. Ribi, C. E. Ulrich, E. Wolinsky. 1973. Protection of monkeys against airborne tuberculosis by aerosol vaccination with bacillus Calmette-Guerin. Am. Rev. Respir. Dis. 107: 351-358. Lefford, M. J.. 1977. Induction and expression of immunity after BCG immunization. Infect. Immun. 18: 646-653. Lyadova, I. V., H. M. Vordermeier, E. B. Eruslanov, S. V. Khaidukov, A. S. Apt, R. G. Hewinson. 2001. Intranasal BCG vaccination protects BALB/c mice against virulent Mycobacterium bovis and accelerates production of IFN-γ in their lungs. Clin. Exp. Immunol. 126: 274-279. Vordermeier, H. M., N. Venkataprasad, D. P. Harris, J. Ivanyi. 1996. Increase of tuberculous infection in the organs of B cell-deficient mice. Clin. Exp. Immunol. 106: 312-316. Wang, J., A. Zganiacz, Z. Xing. 2002. Enhanced immunogenicity of BCG vaccine by using a viral-based GM-CSF transgene adjuvant formulation. Vaccine 20: 2887-2898. Xing, Z., A. Zganiacz, M. Santosuosso. 2000. Role of IL-12 in macrophage activation during intracellular infection: IL-12 and mycobacteria synergistically release TNF-α and nitric oxide from macrophages via IFN-γ induction. J. Leukocyte Biol. 68: 897-902. Santosuosso, M., M. Divangahi, A. Zganiacz, Z. Xing. 2002. Reduced tissue macrophage population in the lung by anticancer agent cyclophosphamide: restoration by local granulocyte macrophage-colony-stimulating factor gene transfer. Blood 99: 1246-1252. Lane, C., J. Leitch, X. Tan, J. Hadjati, J. L. Bramson, Y. Wan. 2004. Vaccination-induced autoimmune vitiligo is a consequence of secondary trauma to the skin. Cancer Res. 64: 1509-1514. Santosuosso, M., J. Wang, Z. Xing. 2005. The prospects of mucosal vaccination against pulmonary tuberculosis. L. T. Smithe, ed. Focus on Tuberculosis Research 141-164 Nova Science, Hauppauge. .
Wang, J., K. Palmer, J. Lotvall, S. Milan, X. F. Lei, K. I. Matthaei, J. Gauldie, M. D. Inman, M. Jordana, Z. Xing. 1998. Circulating, but not local lung, IL-5 is required for the development of antigen-induced airways eosinophilia. J. Clin. Invest. 102: 1132-1141. Caruso, A. M., N. Serbina, E. Klein, K. Triebold, B. R. Bloom, J. L. Flynn. 1999. Mice deficient in CD4 T cells have only transiently diminished levels of IFN-γ, yet succumb to tuberculosis. J. Immunol. 162: 5407-5416. Xing, Z., J. Wang, K. Croitoru, J. Wakeham. 1998. Protection by CD4 or CD8 T cells against pulmonary Mycobacterium bovis bacillus Calmette-Guerin infection. Infect. Immun. 66: 5537-5542. Mogues, T., M. E. Goodrich, L. Ryan, R. LaCourse, R. J. North. 2001. The relative importance of T cell subsets in immunity and immunopathology of airborne Mycobacterium tuberculosis infection in mice. J. Exp. Med. 193: 271-280. Serbina, N. V., V. Lazarevic, J. L. Flynn. 2001. CD4+ T cells are required for the development of cytotoxic CD8+ T cells during Mycobacterium tuberculosis infection. J. Immunol. 167: 6991-7000. Flynn, J. L., M. M. Goldstein, K. J. Triebold, B. Koller, B. R. Bloom. 1992. Major histocompatibility complex class I-restricted T cells are required for resistance to Mycobacterium tuberculosis infection. Proc. Natl. Acad. Sci. USA 89: 12013-12017. Tascon, R. E., E. Stavropoulos, K. V. Lukacs, M. J. Colston. 1998. Protection against Mycobacterium tuberculosis infection by CD8+ T cells requires the production of γ interferon. Infect. Immun. 66: 830-834. Wang, J., M. Santosuosso, P. Ngai, A. Zganiacz, Z. Xing. 2004. Activation of CD8 T cells by mycobacterial vaccination protects against pulmonary tuberculosis in the absence of CD4 T cells. J. Immunol. 173: 4590-4597. Kamath, A. B., J. Woodworth, X. Xiong, C. Taylor, Y. Weng, S. M. Behar. 2004. Cytolytic CD8+ T cells recognizing CFP10 are recruited to the lung after Mycobacterium tuberculosis infection. J. Exp. Med. 200: 1479-1489. Kunkel, E. J., E. C. Butcher. 2002. Chemokines and the tissue-specific migration of lymphocytes. Immunity 16: 1-4. Johnston, B., E. C. Butcher. 2002. Chemokines in rapid leukocyte adhesion triggering and migration. Semin. Immunol. 14: 83-92. Palendira, U., A. G. Bean, C. G. Feng, W. J. Britton. 2002. Lymphocyte recruitment and protective efficacy against pulmonary mycobacterial infection are independent of the route of prior Mycobacterium bovis BCG immunization. Infect. Immun. 70: 1410-1416. Feng, C. G., W. J. Britton, U. Palendira, N. L. Groat, H. Briscoe, A. G. Bean. 2000. Up-regulation of VCAM-1 and differential expansion of β integrin-expressing T lymphocytes are associated with immunity to pulmonary Mycobacterium tuberculosis infection. J. Immunol. 164: 4853-4860. Huygen, K., J. Content, O. Denis, D. L. Montgomery, A. M. Yawman, R. R. Deck, C. M. DeWitt, I. M. Orme, S. Baldwin, C. D’Souza, et al 1996. Immunogenicity and protective efficacy of a tuberculosis DNA vaccine. Nat. Med. 2: 893-898. Tanghe, A., J. Content, J. P. Van Vooren, F. Portaels, K. Huygen. 2001. Protective efficacy of a DNA vaccine encoding antigen 85A from Mycobacterium bovis BCG against Buruli ulcer. Infect. Immun. 69: 5403-5411. Kamath, A. T., C. G. Feng, M. Macdonald, H. Briscoe, W. J. Britton. 1999. Differential protective efficacy of DNA vaccines expressing secreted proteins of Mycobacterium tuberculosis. Infect. Immun. 67: 1702-1707. Morris, S., C. Kelley, A. Howard, Z. Li, F. Collins. 2000. The immunogenicity of single and combination DNA vaccines against tuberculosis. Vaccine 18: 2155-2163. Wang, J., Z. Xing. 2002. Tuberculosis vaccines: the past, present and future. Expert Rev. Vaccines 1: 341-354.